What does it mean that Jesus fulfilled “all righteousness” when he was baptized? Jesus’ whole life, his ministry, beginning from his baptism by John in the Jordan until his suffering and death on the cross, is the “baptism” that fulfills all righteousness. Just as all died with him on the cross (2 Cor 5:15), all were baptized with him in Jordan. Some thoughts on the ordinance of baptism in the light of Epiphany. At Epiphany, January 6, many Christians have traditionally celebrated the revelation of God as incarnate in Jesus Christ. 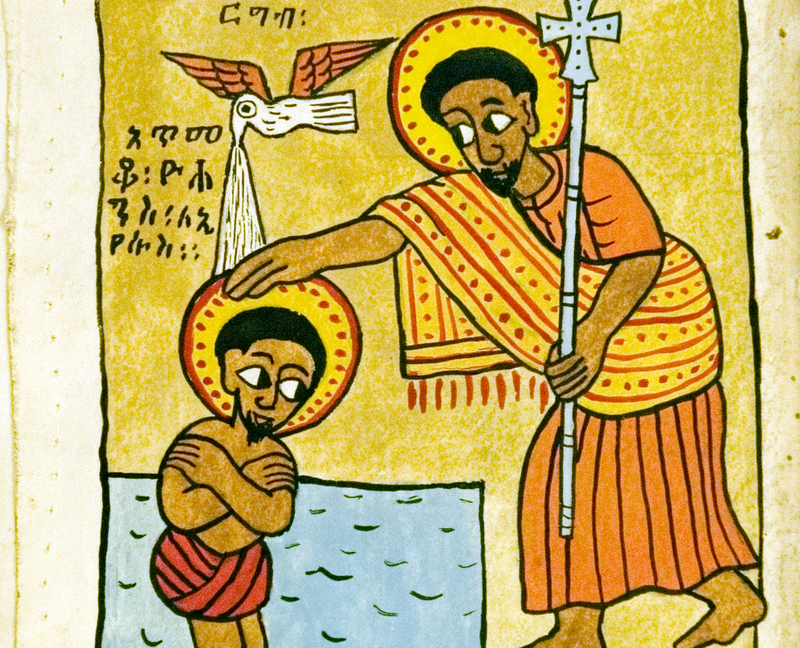 One of the things commemorated at Epiphany is the baptism of Jesus (especially in the eastern church). Ethiopian Biblical Manuscript U.Oregon Museum Shelf Mark 10-844. But why did Jesus need to be baptized in the first place? John’s baptism was a baptism of repentance (Acts 19:4), but Jesus, being free of sin, did obviously not need to “repent”. This was clear from John’s reluctance to baptize him. But Jesus replied, “Let it be so now; it is proper for us to do this to fulfill all righteousness.” (Matt. 3:15). Then John consented to baptize Jesus. So what does it mean that Jesus fulfilled “all righteousness” when he was baptized? Didn’t this only happen later, when he died at the cross? I think we need to be aware, that the New Testament has a broad concept of “baptism”. Besides the baptism in water, there’s the baptism of the spirit, of course. But more important in this context, Jesus talks of his suffering and death as a baptism: ”But I have a baptism to undergo, and what constraint I am under until it is completed!” (Luke 12:50). This is the baptism that fulfills all righteousness. Or rather, we might say that Jesus’ whole life, his ministry, beginning from his baptism by John in the Jordan until his suffering and death on the cross, is the “baptism” that fulfills all righteousness. Perhaps we might even say, that just as all died with him on the cross (2 Cor 5:15), all were also baptized with him in Jordan. This seems to have been James Relly’s view, when he concluded that through our eternal union with Christ we have also by his baptism fulfilled all righteousness: “Has he fulfilled all righteousness? So have we. Is he justified? So are we.” (Relly 1776, pp. 125f). James Relly and later Judith Murray concluded from the fact that we have in a sense already been baptized with Christ in Jordan, that we don’t need to be baptized in water now (though we need the baptism of the Spirit to know that we are justified by Christ). The ordinance of baptism in water they felt to be outdated. I can follow the reasoning of Relly and Murray, though I don’t agree with their conclusion regarding the ordinance of baptism. It’s true that it is not our individual baptism in water that justifies us or unites us to Christ, as the sacramentalist churches have traditionally claimed. But this doesn’t mean that we should stop baptizing. Baptists (like Richardson and Gill) have in distinction from sacramentalist churches traditionally claimed, like Relly and Murray, that it is Christ alone that justifies (and not, e.g., sacraments). But they have not for this reason stopped baptizing. Rather, individual baptism in water is our response to a reality that is already there. Similarly, Karl Barth also taught that we are justified by Christ alone before we believe and are baptized. When Jesus was baptized he repented on behalf of the whole world, which was then reconciled to God. But like traditional baptists Barth also saw individual baptism as a response to our justification by Christ (Church Dogmatics IV,4). This logic runs parallel to Paul’s when he says that God has reconciled the whole world to himself in Christ, but then goes on to exhort us to “be reconciled to God!” (2 Cor 5:17-20). We are reconciled, but are to be reconciled. Notice that this does not mean that our reconciliation by Christ is only ‘potential’, so that it must be put in effect by our choice and efforts (this would be an unevangelic synergistic conception). Our personal reconciliation to God is simply our response to the reconciliation that God has already put in effect for us in Christ. Perhaps we could say in a similar vein, that we are already baptized with Christ on the one hand, but that we are still to respond to this baptism with him in our own baptism on the other. This logic of baptism would accentuate believer’s baptism as the most appropriate form of baptism, but it wouldn’t (as traditional baptist accounts of baptism) exclude those baptized as infants as being ‘unbaptized’. We are all baptized with Christ, but there are individual baptisms which are all signs of this “one baptism” (Eph. 4:5) which we confess together with the “one lord” who was baptized – some more, some less adequate, but never invalid (though this may seem to pedobaptists to devalue infant baptism it should be rather uncontroversial that as a sign believer’s baptism more closely corresponds to Jesus’ baptism). Our baptism can never be a way to righteousness, but only a sign corresponding to the one incarnate Christ who has already fulfilled “all righteousness”. Happy Epiphany!